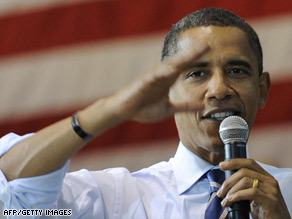 (CNN) -- Sen. Barack Obama said he has decided on his running mate, but he's not saying who it is. Barack Obama said he has decided on his VP pick but is not ready to reveal it yet. "I won't comment on anything else until I introduce our running mate to the world," he said Thursday. "That's all you're going to get out of me." Obama is expected to appear at a rally with his running mate in Springfield, Illinois, Saturday. It's unclear just when the campaign will announce the vice presidential choice via text message. Most of this week's buzz has been around Indiana Sen. Evan Bayh, Delaware Sen. Joe Biden and Virginia Gov. Tim Kaine. The first-term governor also would neither confirm nor deny reports he was being vetted, but he said he was flattered to be mentioned as a contender. "My mom in Kansas City loves it when someone will talk about me as VP," he said. Kaine also said he thinks that if Obama can take Virginia -- which hasn't voted for a Democratic president in 44 years -- then the senator from Illinois would win the White House. Kaine will be back in the spotlight later Thursday as he campaigns with Obama in Virginia. Darkhorse contender Hillary Clinton re-entered the conversation this week following a poll indicating that nearly half of her supporters have yet to embrace Obama. The poll has a margin of error of plus or minus 3.1 percentage points. The New York senator was considered one of the top VP contenders shortly after she ended her own White House run, but rumors of lingering tension between the former rivals and word that her name would be placed in nomination at the convention are partially to blame for kicking her out of the top tier. Independent presidential candidate Ralph Nader said Clinton is the smart choice because she is the only person who would help Obama get more votes. "And if he's going to say, 'One people, one nation,' he can raise the banner of unity with her as his vice presidential running mate," he said Thursday on "American Morning." Nader also told Politico.com that Obama wouldn't be "that dumb" to pick Bayh or Biden to be vice president. Other big names thought to be in the running include retired Gen. Wesley Clark, Connecticut Sen. Chris Dodd, Texas Rep. Chet Edwards, Nebraska Sen. Chuck Hagel, Virginia Gov. Tim Kaine, former Georgia Sen. Sam Nunn, Rhode Island Sen. Jack Reed, New Mexico Gov. Bill Richardson and Kansas Gov. Kathleen Sebelius. CNN's Alexander Mooney, Chris Welch and Kristi Keck contributed to this report.